I recently discovered the Gatorade blog and find it interesting that someone seemingly promoting Gatorade would also promote a competitor in Vitamin Water. Sure they have signed many athles to endorse the product but why? It appears Glaceau is making an attempt to get ahead of the Pepsi marketing curve (which is the parent company of Gatorade) who has recently released its own version of vitamin fortified water under the SoBe brand Life Water. The packaging of both products are virtually the same but neither really compare to Gatorade or Powerade - or other sports drinks for that matter. Vitamin Water and Life Water is just that- Water, with a few added vitamins and some flavor. Just as Gatorade has no added benefits to individuals not on an exercise program, I do not see any benefit to paying for flavored water, only because I like plain water and drink plenty of it. I'm not promoting Gatorade. My blog is on the good and the bad of Gatorade. I talk about everything involved with the brand. I really dig the vitamin water and have for some time. Gatorade and that crap is WAY too sweet for my taste. I like the varied tastes of the vitamin water, especially their teas. Most teas you can get at the convenience store have tons of crap in them so I appreciate a product that I can drink that tastes good and will actually quench my thirst. 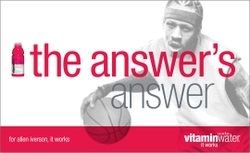 As a long time fan I've Iverson, I'm happy to see him endorsing a product like this because he only endorses products he likes and uses himself. That's pretty cool. Vitamin water makes a really tasty light dessert though. If you put it in the freezer for an hour it turns to grantia (a sign of all the sugar) and winds up being really really tasty. The best ones for this are energy and focus I think. yeah i am with the bro that vitamin water is even better than carrie underwood!so dont make problems about it is the best vitamin water i ever drink. i think that everyone have the liberty of consume what ever they want so dont make such a problem of this.i they want to drink it so let them do it. There's a new prduct out there called SoNu Water which is similar to Vitamin water except (I think) it's a little bit better. There's no after taste and it has vitamins, electrolytes and antioxidants. It comes in 6 different flavors- which are all a combination of 2- such as pomegranate/acai, strawberry/cranberry, mango/peach, blueberry/pear, lemon/tangerine and tropical/passiont fruit. You guys should check it out. flavored water. You may also take round to the site. flavored water and how it is made can easily try this site . i found a cool review of vitamin water here: http://onthebutton.wordpress.com/2009/06/18/vitamin-water/ it's not so much about the drink as it is about the brand. but interesting nonetheless. Hi Vitamins are essential for the normal growth and development of a multicellular organism. Using the genetic blueprint inherited from its parents, a fetus begins to develop, at the moment of conception, from the nutrients it absorbs. It requires certain vitamins and minerals to be present at certain times. These nutrients facilitate the chemical reactions that produce among other things, skin, bone, and muscle.Thank you for the helpful information. I hope you keep up the good work on making your blog a success! Nice blog! drinking vitamin water helps and gives you energy like in gatorade and its very essential to those in the field of sports. Gatorade is good because it replace the electrolytes that you loose when you work out but vitamin water helps you a lot when you are sick and you need to hydrate your body because as you notice when you visit the doctor he always told you "don't drink Gatorade or Powerade". So many victims due to harmful habit of a person. Smoking habit causes harm to the smoker as well as to the people around them. I read here it is possible to quit the habit naturally and with the help of medicines.